The event was shortened this year due to a thunderstorm in the middle of the night. 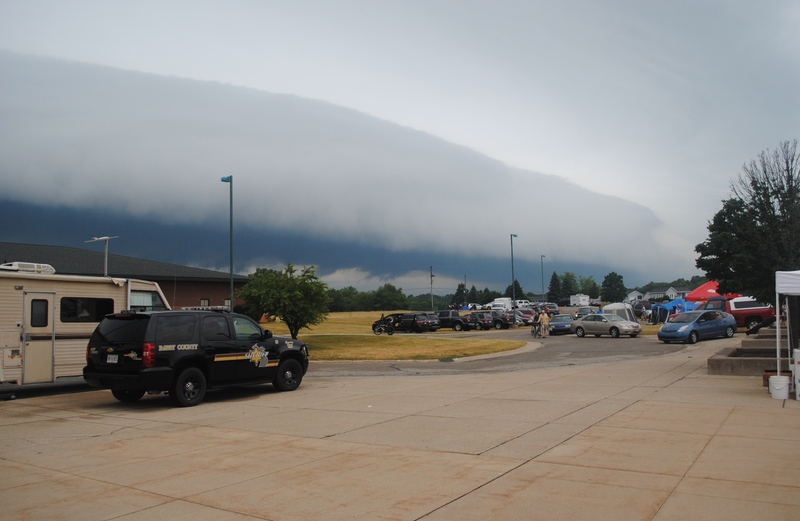 Shortly after midnight (12:07 AM), lightning conditions caused officials to suspend riding and riders huddled with their bikes in the Thornapple-Kellogg Middle School building. The slow-moving storm eventually passed and riders were back on the road at 4:17 AM. This was the longest suspension in the event’s year 35-year history. Safety Director Gary Goscenski (Paw Paw, MI) was being advised by rider Joe Lundberg, a TV meteorologist from State College, PA. Joe in turn was being updated by two of his meteorology co-workers back in Pennsylvania. Weather radar was put to good use. As for the ride itself, a similar storm early Saturday morning left support crew tents tangled and wet, but didn’t impact the start of the event. At the starting ceremony, riders from the United States, Bulgaria, Sweden, Brazil, Canada, India, and Mexico were honored with their flags and national anthems. Promptly at 8:00am, the riders made their way out of the starting area and on to the roads of Barry County, with the front-runners setting a blistering pace. That pace was facilitated by good weather for riding – overcast, warm and only slightly humid, with light winds. The front-runners completed their 126-mile lap of the county in just over five hours, and Ellsworth Wisconsin’s Jessop Keene, 25, led Billy Volchko of Kent, OH, and Scott Perry of Fishers, IN, after steaming through the checkpoint. The three leaders continued into the night, each putting up 265 miles in the first 12 hours. At night, rain both preceded and followed the suspension period, causing everyone’s totals to drop in the end. While no new records were set due to the suspension, defending champion Jessop Keene (Ellsworth, WI), 25, set a blistering pace and completed 425.5 miles in 19 hrs, 50 min of riding time, about 21.5 mi/hr average. Daniela Genovesi (Rio de Janeiro, Brazil), 49, and Jessica Anderson (Raleigh, NC), 28, tied for Women’s Overall High Mileage with 378.7 miles, a 19 mi/hr average. First-time riders made up 26% of the field and they performed remarkably well. Scott Perry (Fishers, IN) rode 402.7 miles to take the gold in M45-49. Jonathan Kindig (La Grange, KY) rode 331.9 miles, earning him the gold in M40-44. Matt Kovacic (Rockville, MD) rode 285.1 to earn the gold in M18-24 and Lib Rood (Frederick, MD) rode 261.1 miles to win gold in F50-54. The National 24-Hour Challenge regularly draws riders from all over the USA and, indeed, the world. It is the largest 24-hour road bicycle event (by number of riders) in the world today. In its 35-year history, N24HC has drawn riders from every US State except North Dakota, as well as at least 13 foreign nations. Old friends joined us: Jim Hlavka (Racine, WI), who has accumulated 10,000-plus miles over the years, paid us a visit. Event founders Skip and Diane Obermeyer worked as volunteers. Multiple Overall High Mileage female and RAAM veteran, Nancy Guth, returned to the site of her first 24-hour ride. This year we awarded sixteen 1,000-mile jerseys and five 5,000-mile jackets to riders who have accumulated miles over several years. In a case of life imitating art, rider Christopher Blunt (Leslie, MI) author of Full Cycle, about a father/son bicycling adventure, joined us to ride the 24 with his daughter, Mary Grace. Mary Grace impressed everyone by winning gold in her age bracket with 305.6 miles, right alongside her dad. And 2017 was also a momentous year in that the National 24-Hour Challenge saw its Co-Directors, Kathy and Pete Steve, of Caledonia, MI, handle their final event. They will be enjoying a well-deserved second retirement after captaining the ship for the last ten years. The board is actively working to secure new leadership for 2018, but the Steves have left some big shoes to fill. In all, 241 riders posted mileage this year. Riders came from all over the USA and seven foreign countries for the 35th edition. Plans for next year’s event should be announced sometime this summer.